Bullying has always been a problem in schools, but it seems like it's running more rampant these days, with the nexus of cyber bullying in the past few years. Or maybe this is just something the media is choosing to emphasize right now and will move onto something else next year. Though as a teacher, I hope this is always something that is on the forefront of everyone's psyches. I was listening to the radio the other morning and they were having listeners call in about a particular mom that took the law into her own hands and beat the crap out of a girl who was bullying her daughter. The hosts of the morning show were talking about how what the mom did was obviously not the right way to handle the situation, but as a parent, when the school is not helping, they could understand the anger and frustration that would lead you to do something like that. Then some meat-head called in and said something along the lines of, "Well I was bullied as a kid. Lots of kids are bullied. It's just a part of growing up. It toughens kids up." Really dude? Because there's a difference between going through a tough situation to build character and being mercilessly tormented. There's a difference between being challenged and being so afraid to go to school that it affects your health. Kids who are bullied aren't always just faking medical maladies to avoid going to school. Many of them suffer digestive ailments, debilitating headaches, and many other medical conditions induced by the stress of dealing with their tormentors on a daily basis. I know. I speak from experience. I was bullied in 7th grade. It was during that year of my school career that I began to develop what would be a long string of digestive ailments that have followed me around my entire life. From that moment on, that one year of my life would define how my body handled stress and it continues to manifest in new and frustrating ways - all from just one single year of my life almost twenty years ago. So you see, this isn't something that should be expected to be a part of growing up. We should all be doing something to try to stop it from happening. So seventy authors got together and compiled their own stories to help kids know that they're not alone. 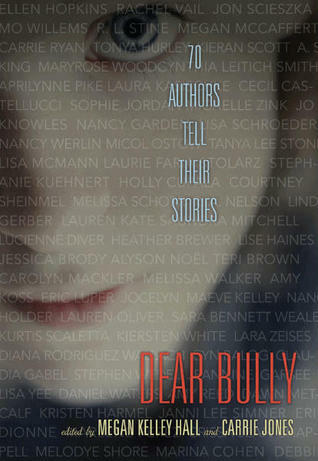 Dear Bully is an important work for kids to read on their own, but it would be even better for middle and high school teachers to use these stories as a place to begin the conversation in their classrooms and at their faculty meetings about how they can help prevent this from continuing to run rampant throughout our schools. Every author's story in this book is unique to their own voice, but heartbreaking to read. And yet, so necessary to share with the world. I made sure to flag some of the more memorable stories from this compilation and will be using them as read-alouds in my literature classes to help get this conversation going. One thing I think that is a really important take-away for adults reading this book is that telling a kid who's being bullied to just ignore their tormentor is like rubbing salt in a wound. Most likely the child has already tried this and to no avail. Oftentimes bullies who are ignored only torment harder. I was told this very thing by my parents and other adults in my life and my bully didn't stop tormenting me until a year later when we were no longer in the same homeroom and moved onto bigger and better things. We need to remember that kids don't have the ability to think long-term. They are in the here-and-now. When you tell them, "Someday this won't even matter to you anymore," it is not helpful because most of the time, they are incapable of thinking past next week, let alone years into the future. That is why a book like this is so important. Kids can read this book and see that, despite everything they've been through, the bullies didn't win. At the very least I pray this book will help give kids hope. At the most, it may even save some lives.